Expo Europe Facts & Figures, Conference Slides & Stuttgart 2019! EXPO EUROPE Facts & Figures, Conference Slides & Save the Date for Stuttgart 2019! 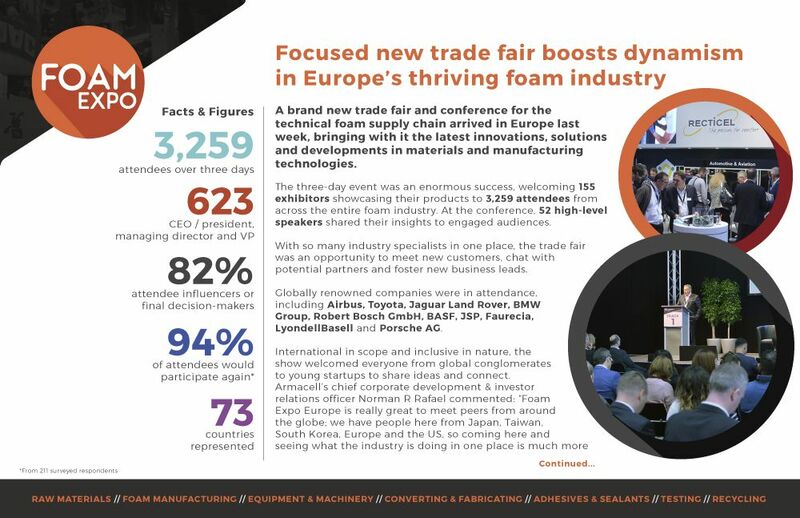 Foam Expo Europe arrived for the very first time in Hannover earlier this month, bringing with it the latest innovations, solutions and developments in foam materials and manufacturing technologies. A phenomenal 3,259 attendees visited the show from globally renowned companies such as Airbus, Toyota, Jaguar Land Rover, BMW Group, Robert Bosch GmbH, JSP, Faurecia, Porsche AG and many more. In your post show issue, we look back on some exciting moments in our photo gallery and conference highlights, plus you can download the official Post-Show Report for all the facts, figures and testimonials from the event here.